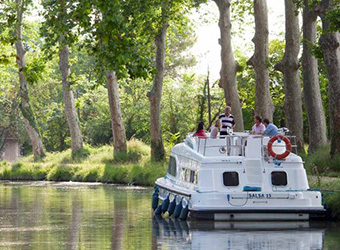 A canal-boating holiday along the tranquil waterways of rural France is an ideal way to experience the Gallic way of life at a leisurely pace. With over 8,000 kilometres of rivers and canals to choose from and a range of vessels that range from simple and well-equipped to spacious and luxurious, all you need to decide is which direction to point the bow and who is having first turn as skipper. From the wine-producing regions of Alsace-Lorraine and Burgundy to the grand châteaux of the Loire Valley and medieval villages of the Midi, France is criss-crossed with rivers and canals that you can explore at your own pace, venturing ashore to explore on foot or by bicycle whenever you choose. There are hundreds of routes to choose from, taking in some of France’s greatest and smallest waterways, from the Marne-Rhine Canal to the Saône and Lot Rivers. Your personal travel manager can help you choose the right canal boat company and the right canal boat or river yacht to suit your needs, ranging in capacity from two to twelve passengers, with a variety of comfort options to suit your needs. Designed as a home away from home, the boats come with all the modern comforts you’d expect, and are ingeniously designed to maximise your space and comfort. Maybe you’d like to start each day by cycling into the nearest village for the morning baguettes, before an active day spent exploring the local attractions and negotiating locks. Or perhaps you prefer the idea of lazing on the deck in the sunshine, dreamily watching the countryside drift by as someone else does the navigating, feasting on local produce and sipping local wines. A canal boat holiday can provide the desired level of activity for every member of the group. With a recommended cruising speed of just eight kilometres per hour, you’ll have plenty of time to soak up the scenery, but you can slow down even more by making regular forays ashore to explore the surrounding landscape. Most of France’s waterways have locks that need to be navigated: necessary feats of engineering that provide further opportunities to take your time, chat to the locals and pick up tips from lock-keepers and fellow boaters. At the start of your holiday, your canal boat operator will give you an extensive tour of your home away from home, demonstrating how to use the equipment and skipper the vessel. They’ll also help you design a route that provides an ideal balance between time on the water and time ashore, and explain how to manage locks and moorings. They will also provide an extensive guide to the regions you’re passing through, including suggested ports of call and even restaurant recommendations along your route. It doesn’t matter if you’re a complete novice or an accomplished sailor – anyone can enjoy a canal boat holiday. If you’re looking for a holiday experience that lets you leave the stresses of normal life far behind, a canal boat could be a wonderful option for you – ask your personal travel manager for details.